Take your course over the top! To really add some pizzazz to your course, add flags to your baskets. 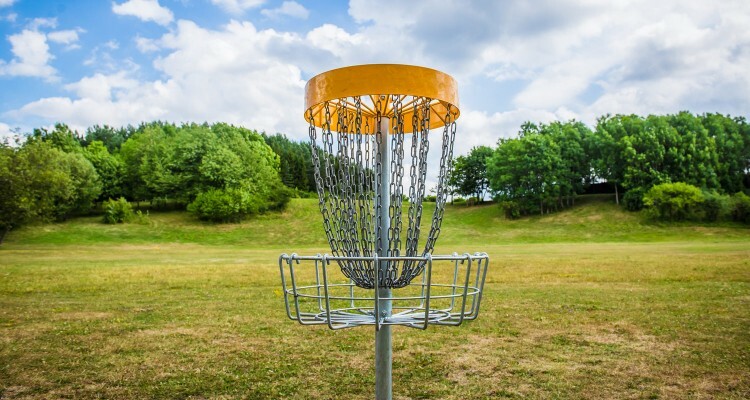 Not only do they look sharp, they provide players with a read of the wind and can inform non-players that disc golf is played much like golf. Our flags are easy to install on top of a DISCatcher® PRO with minimal work. Made with a high grade nylon base, fiberglass pole, and stainless steel hardware. Flagsticks extend 32 inches above the target, and the flags themselves are 14 by 20 inches. They can be stored and installed for tournaments or left in place year round. $25 per flag (includes flagstick and mounting bracket). Our Tee Markers allow you to set markers for grass tees by drilling a pilot hole in the ground and hammering a stake in place. These are great for natural tees, but also work when you want to add another tee position to an established course, or to mark a drop zone on holes that require a rethrow. They come in red and blue, and are an economical way to mark your course. Stakes are designed to go in easily, but not to come out easily. $30 per pair.